Dwayne Haskins didn’t really have anything he needed to prove heading into Ohio State’s Pro Day. 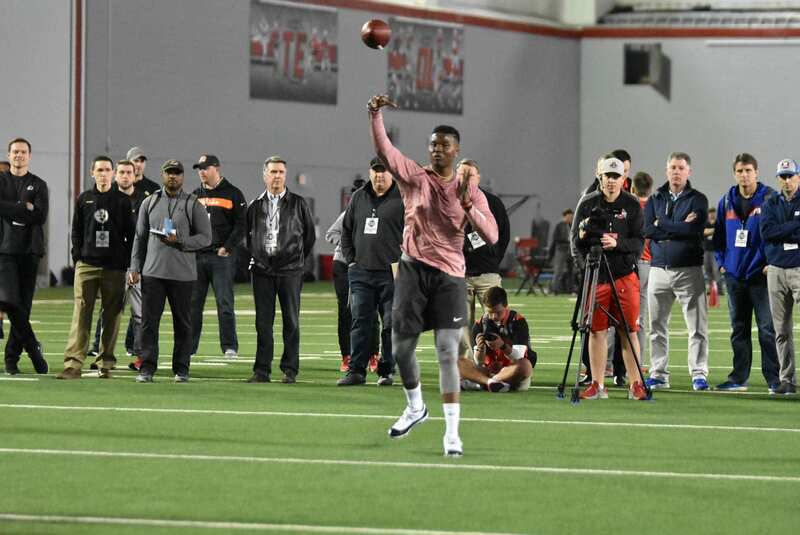 Already considered a top-two quarterback by many in this year’s NFL Draft class, Haskins could have sat out Pro Day completely and not much would have changed. Instead, at about 1:25 p.m., after a lack of any real excitement earlier in the day due to the absence of defensive end Nick Bosa in the drills, Haskins took the field and showed everyone exactly why he has been so highly ranked to this point. Haskins threw 50 passes from the 50-yard line and completed 45 of them, including each of his throws of 40 or more yards. Four of his incompletions were well thrown, but dropped by the receiver. In his throws inside the red zone, Haskins completed 13-of-14 passes. When you ask Haskins about his performance, he could wrap it up in one word. This type of performance doesn’t come as much of a surprise. When in full pads against actual defenses, Haskins completed 70 percent of his passes and tied for the fourth most touchdown passes in NCAA history. But on Wednesday, when none of those stats mattered, Haskins still found a way to impress with the accuracy of his arm and surprising mobility in the pocket. For the quarterback who only spent one season behind center for Ohio State, his final return to the Woody Hayes Athletic Center before heading to the pros was a bittersweet one. But Haskins knows what is now important, and he’s known what’s important before he even got his chance to start in 2018. His performance at Pro Day only pushed him closer to the same end goal he’s had since he was in grade school. Haskins described college pass openings as “windows” and NFL ones as “keyholes” to describe the increased difficulty he is ready to face. For Day, he said he is proud of everything Haskins did for Ohio State over the past season. He said his development will show recruits just how much can be accomplished in the program. There are about five weeks separating Haskins from his future NFL team. He leaves Ohio State with quite possibly the most impressive statistical season by any quarterback in program history. But that was not the goal for Haskins all his life, and that’s not what his Pro Day was meant to show the world. All of that is set toward the future, and for a team to have as much confidence in Haskins as he has for himself. “I feel like I’m the best player in the draft,” Haskins said.